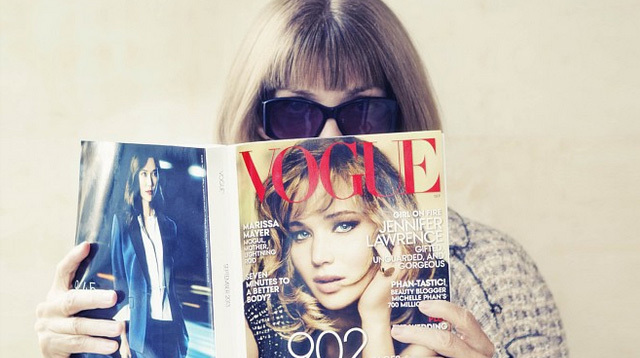 Anna Wintour wants the Duchess of Cambridge, Kate Middleton, to appear in Vogue. The fashion and lifestyle magazine's editor-in-chief is reportedly desperate for Duchess Catherine to be featured in the September issue of the publication. A source shared: "Anna knows landing Kate for the September issue would be a huge coup, especially since Prince William's wife has never done a magazine feature for a US publication. The focus of Kate's feature would be her numerous charity endeavors, which Anna has conveyed to Kate's staff." Anna hopes to persuade Catherine to take part in order to boost sales of the magazine following the uproar she caused after putting Kim Kardashian West and Kanye West on the cover last year. The insider told gossip site RadarOnline.com: "Since Anna is British, she feels a kinship with Kate, and has promised she would have full control over the accompanying photo shoot. "Kate could choose the photographer, journalist, and location for the piece. "Anna has been trying for the last two years to get Kate to agree and she's always refused. But this time, Anna has stepped up the campaign, and is now enlisting her numerous high-powered connections. "Having Kate on the cover would silence all of the critics who were up in arms after Kim and Kanye appeared on the cover. Anna was very well aware that putting a reality star on the cover would alienate some diehard Vogue readers." The 65-year-old editor is now planning to have tea with the 32-year-old royal "in the next few months" as she's not "used to being told no and is determined to get Kate to agree."